Samsung’s ongoing battle against the Chinese competition has resulted in the company launching a bevy of new smartphones this year. We’ve seen five new Galaxy A series phones and three Galaxy M series phones, and Samsung is showing no signs of stopping. 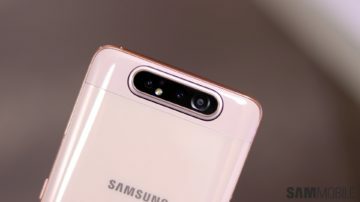 This week, Samsung has announced the Galaxy A80, its first smartphone with a pop-up camera. 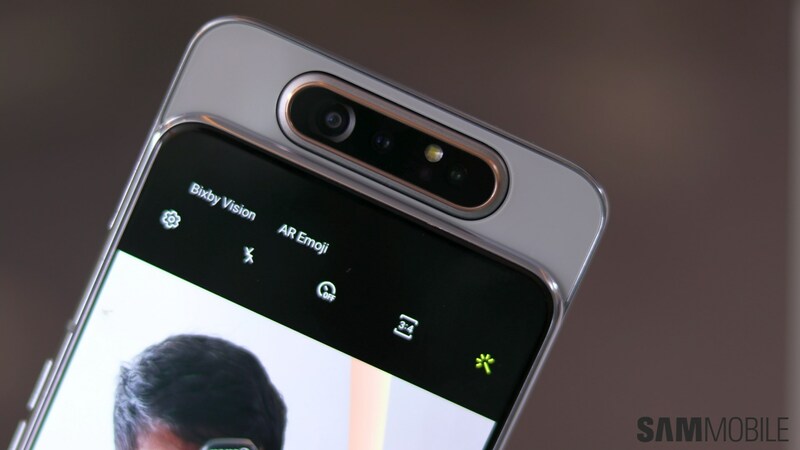 And it’s not just a sliding camera mechanism that the A80 has going for it: The phone has no front-facing cameras and simply rotates the rear camera towards you when you want to take a selfie. Yes, the Galaxy A80 has a pop-up and rotating camera system, and this means your selfies will have the same quality as the photos you take of things around you. 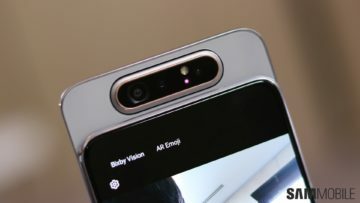 And they’ll be quite detailed as well, since the primary camera on the Galaxy A80 is a 48-megapixel sensor. That’s the highest megapixel count yet on a Galaxy smartphone, and you also have ultra-wide and 3D depth sensors next to that 48MP primary camera. I was able to play with the Galaxy A80 and its pop-up cameras in a short hands-on session in Bangkok, Thailand. Did I come away impressed? Well, you’ll need to continue reading to find out. First off, I have to say the Galaxy A80 is one beautiful phone. 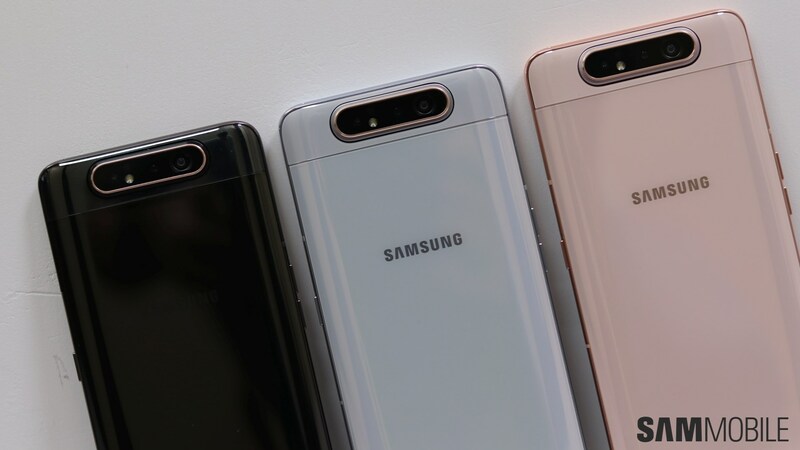 I’ve found all of the company’s new phones with the gradient colors to be very pretty, but I wasn’t prepared for how much better the A80 looks compared to recent A series phones like the Galaxy A50. 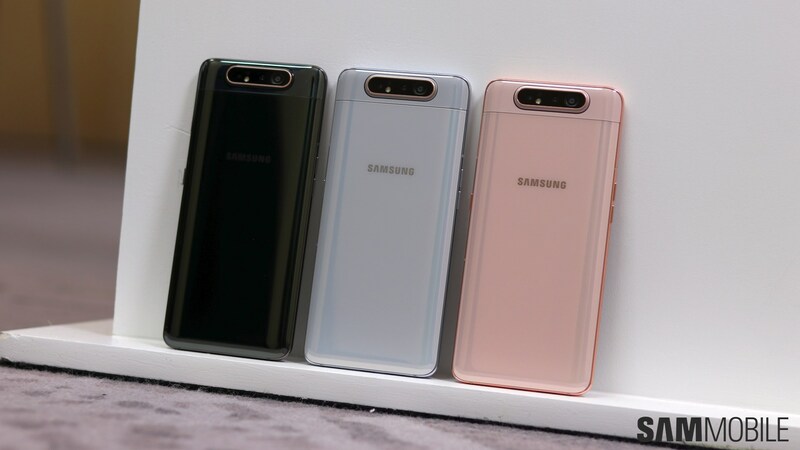 Perhaps it’s because the A80 has glass on the back and not plastic, and the sober color choices (pink, black, and white) no doubt helped as well. There’s also that completely redesigned camera module setup that adds to the charm, and while it may not look that good in the pictures in this article, the camera assembly looks quite classy in real life. The Galaxy A80 is also a big phone thanks to its 6.7-inch screen. But it’s not as big as you’d expect, thanks to the small bezels. 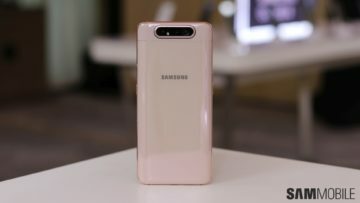 In fact, the top bezel on the A80 is even smaller than the Galaxy S10’s, thanks to the lack of a traditional earpiece. Samsung is using what it calls “sound under display” technology, which basically uses vibrations to transmit sound to your ears (similar to bone conduction tech found on some headphones). 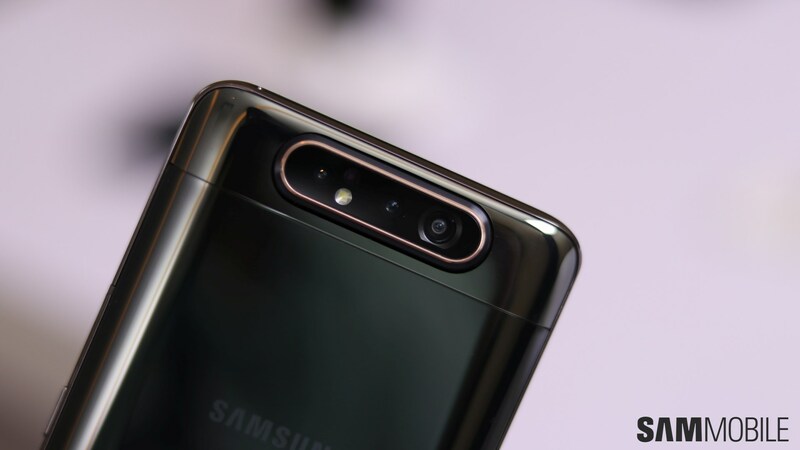 And thanks to the pop-up camera, there’s no notch or hole on the display, allowing the Galaxy A80 to offer a more immersive viewing experience than Samsung’s latest flagship. Nifty rotating camera mechanism, but no facial recognition! Alright, now let’s talk about that rotating and sliding camera setup. My first question to Samsung was the obvious one: How long will that complex camera mechanism last? I was told it won’t pose any issues for a couple of years, and the entire thing looked very well made and felt extremely stable every time the slider went up and the cameras rotated. The only thing that worried me was the gap that was created on the side of the phone when the cameras popped out. Samsung tells me dust won’t be an issue, but the gap looked a bit too big for me to feel reassured. There is also a major limitation on the A80: You don’t get any facial recognition. No prizes for guessing why, of course. Since the camera setup has to rotate every time you want to take a selfie, adding facial recognition would wear out the mechanism a lot faster. But the lack of facial recognition is a shame, because the Galaxy A80 has a time-of-flight (ToF) camera next to the 48MP primary and 8MP ultra-wide cameras. A ToF camera sends out a pulse of light and then measures the time it takes for the light to bounce back, and that can be used for advanced facial recognition similar to Apple’s Face ID technology. What the ToF sensor does enable is the ability to take Live Focus (bokeh) videos. A short test of the Live Focus video feature had me impressed, and Live Focus photos also had a more premium-looking blur effect. 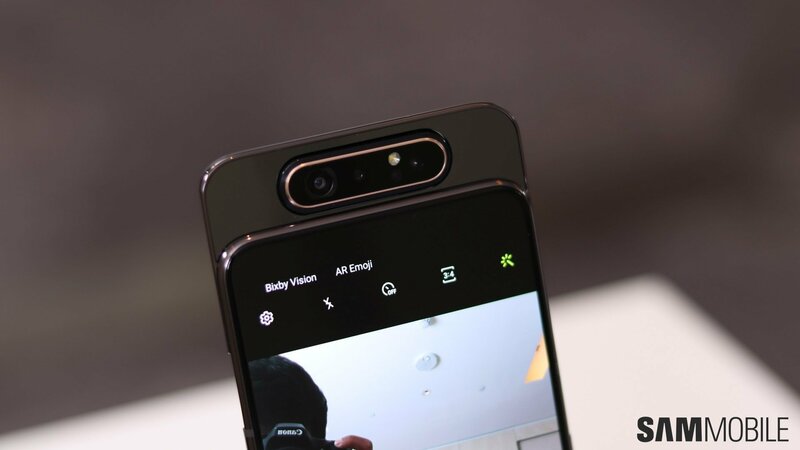 Again, the best part is that you can use the same camera setup for both front-facing and rear-facing pictures and videos, and that includes being able to take ultra-wide selfies as well. I just wish the ultra-wide camera had a higher megapixel count: The 8-megapixel ultra-wide shots will look noticeably less detailed than the 48MP pictures from the main camera. The Galaxy A80 is also special for the fact that it supports super fast charging like the Galaxy S10 5G and the Galaxy A70. 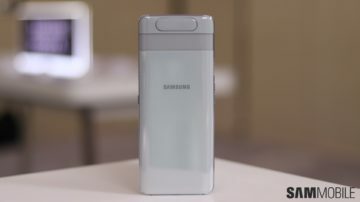 The A80’s 3,700 mAh battery is considerably smaller than the 4,500 mAh battery on the A70 and S10 5G, so the faster charging should be even more useful on the A80. For those unaware, the super fast charging tech allows these devices to draw 25 watts of power from the charger. Samsung’s traditional fast charging on the Galaxy S10 and all of its phones in the last couple of years, meanwhile, only draws 15 watts. But while you will be able to top up the A80’s battery quickly, you won’t be able to expand available storage once you fill up the 128GB of internal storage. Yes, there’s no microSD slot on this phone, another compromise made because of the sliding camera system. 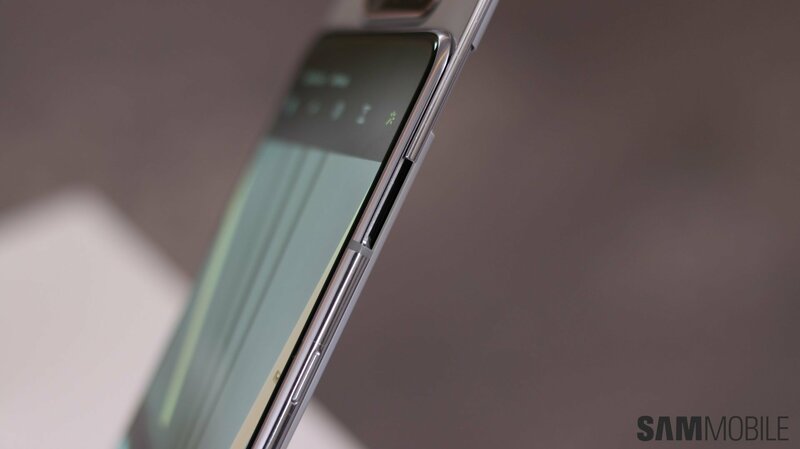 There’s no headphone jack, either, but that’s not really a compromise, only a deliberate decision that Samsung has already made on some devices, including the upcoming Galaxy Fold. 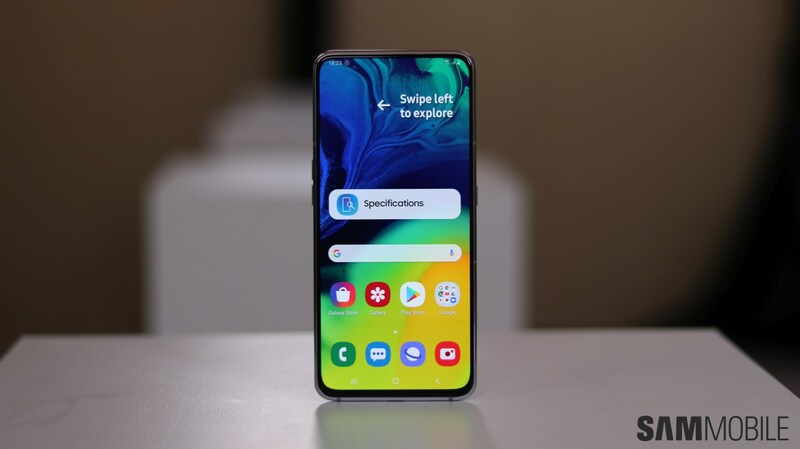 As far as the rest of the specs are concerned, the Galaxy A80 falls in the upper echelon of Samsung’s mid-range phones. It comes with 8GB of RAM as standard and is powered by Qualcomm’s new Snapdragon 730 chipset, and it felt very quick and smooth during my hands-on session. You also get Android Pie with One UI 1.1 out of the box. One UI 1.1 brings features like Bixby Routines and Digital Wellbeing, both of which are available on the A80, and also enables the use of the power button for Bixby Voice. 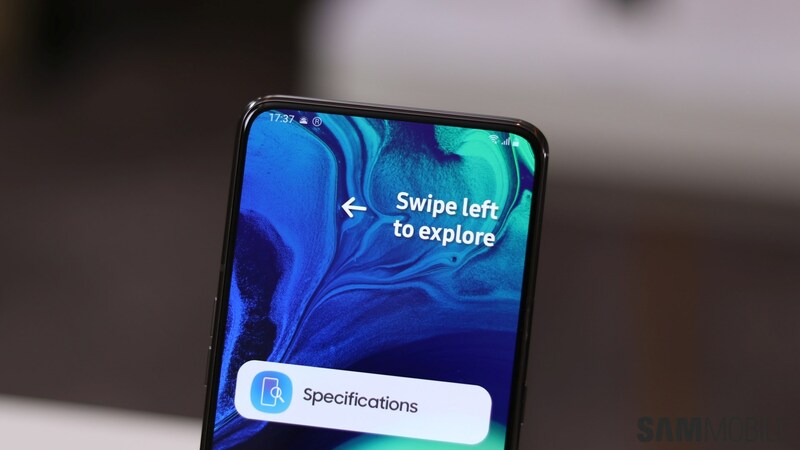 Last but not the least, the Galaxy A80 also has an in-display fingerprint sensor. It’s the optical kind, and if the Galaxy A50 is anything to go by, it won’t work that great. But it’s the only biometric option the A80 offers, so you’ll simply have to get used to it. The Galaxy A80 managed to impress me in the short time I had with it and I can’t wait to test it out more thoroughly. 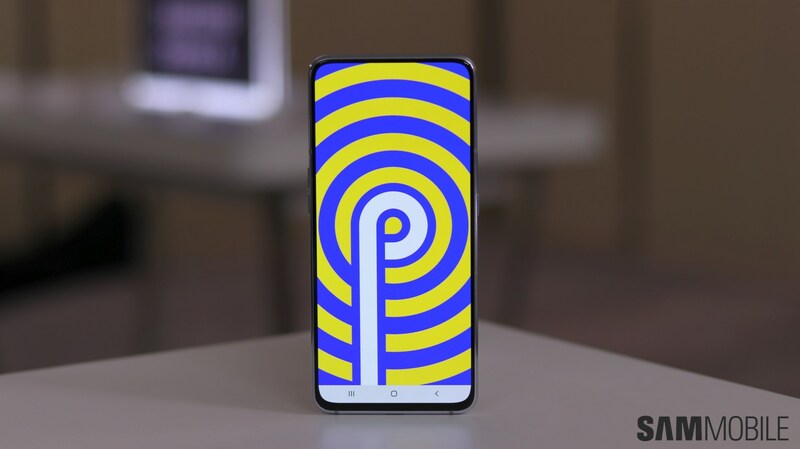 The pop-up camera and rotating mechanism makes it feel quite special, and features like super fast charging, a display with no notch and extremely small bezels, the latest software, and 8GB of RAM further enhance the package. However, I’m not down with some of the limitations. No headphone jack, no expandable storage, and no facial recognition despite the presence of a time-of-flight sensor could turn away some consumers, although I’m hoping the phone will rise above those limitations and offer a good experience in other aspects. 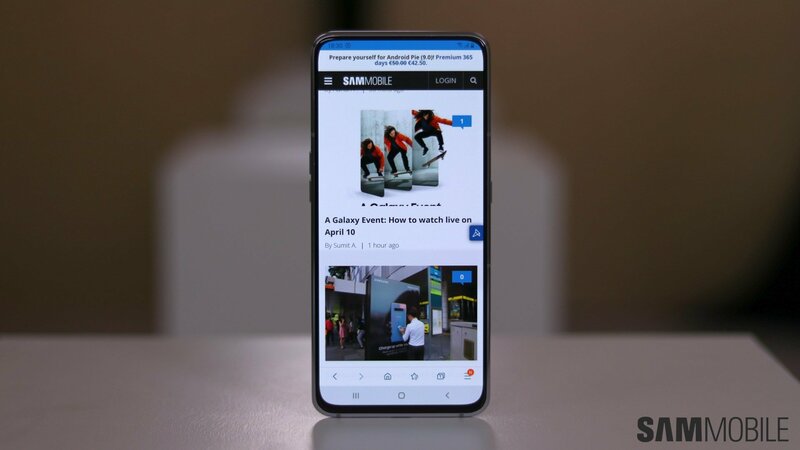 Whether that’s actually the case is something you’ll find out in our full Galaxy A80 review. What’s your take on Samsung’s newest mid-range phone? Samsung is really serious with new A series. They need to fight with chinese manufacturers. Maybe they fixed it since A50 ? Did you checked fingerprint on A80 during hands-on session ? This phone is better than S9 sereis. They save 25W charging feature for S11 or Note 10. How about night photos ? So ToF is better than normal bokeh camera ? Maybe you have review unit that was lacking some functions. I think they add it later with software update. This mean that thic mechanism won’t last too long. They should test it before release and give us number of maximum slides. Just like it was with Galaxy Fold. Where exactly is this gap ? I don’t see it on photos. Ok. Now I see this hole. This is really ugly and dust can be a problem. Samsung must said you that it not cause problems. Imagine if they would tell you that dust can destroy this mechanism. They still can’t remove bottom chin. OMG. Midranger is better than flagship. What about other colors ? Those are the only colors. Maybe in the future they will launch new colors. This is better than S10. Lol. ok ok, but is it 5G? And what about the IP68 rating? Water resistance they left behind last year with the A7 and A9, guess it doesn’t help their bottom line and allows them to put other specs that they need to fight the Chinese. Chinese phones are water resistant ? It really isn’t in person, and the fact that you have that ultra-wide camera and 48MP sensor for both selfies and photos of other stuff should make up for it. It’s the under the hood limitations like no microSD slot that will bother people more.